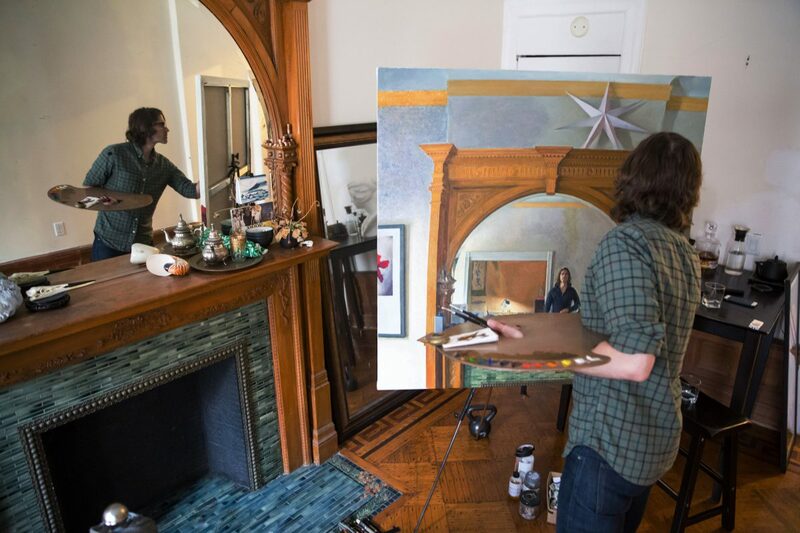 NEW YORK—As he paints, M. Tobias Hall contemplates the changing light of the day interacting with forms. Time can slip by so fast. It’s difficult to be just in the present—without ruminating about the past or being anxious about the future. He’s searching for what many of us yearn for: a way to feel connected with the truth of reality and, simultaneously, with something infinitely greater than ourselves. He doesn’t take himself too seriously, but, in a sense, he’s on a symbolic quest. Like many artists, his creative process lends itself to self-discovery, to feeling connected, to empathy, and to intimacy. It’s a humbling experience. As he paints, it’s as if he’s futilely trying to negotiate a truce with time. 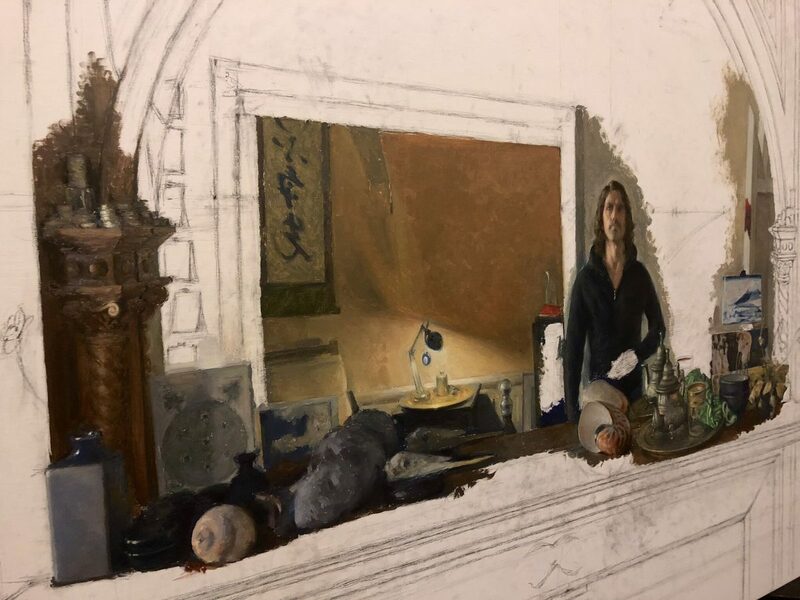 “Sometimes it’s a struggle, sometimes it’s more athletic and visceral, sometimes it’s very cerebral, and sometimes everything is in sync, but it’s different from day to day,” he said with palette in hand, looking at his reflection in the mirror of his mantelpiece. The painting depicts a small figure in a large interior. 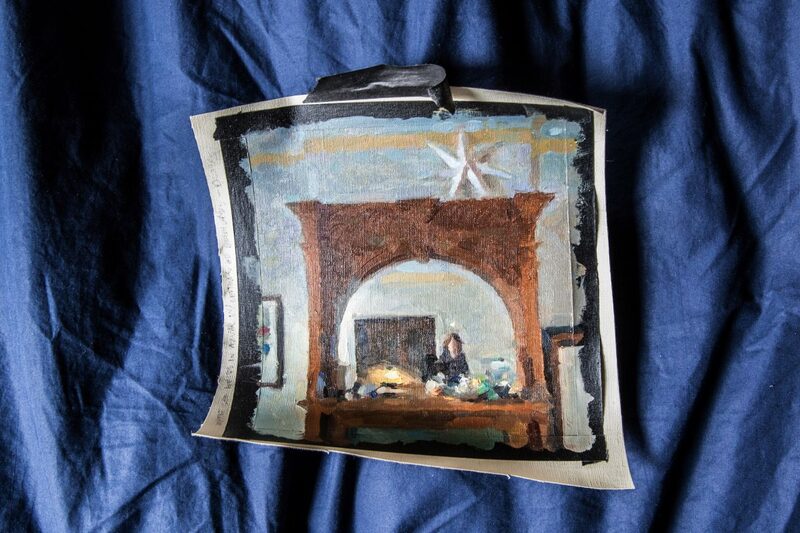 It is a self-portrait in his north-facing apartment, where he paints during the daytime because his studio has only artificial light. His uncluttered living room feels like a sanctuary—a kind of holding place, reflecting his interior world. There, with the intention of keeping all his senses open, he’s faced with the infinite possibilities of what he could paint. “I constantly feel ideas blooming inside of me, but they are elusive; they evolve faster than I can keep up with, and then they fly away. Sometimes I catch a hold of one,” he said. Last winter, one day when he was exploring ideas, he made an oil painting sketch of his large painting in progress. “There was a very particular light on that day,” he said. “At this time of year, I only see that light effect at 6 p.m. on a sunny day. Time and space is the subject, and the light effects are always fleeting. I’m trying to speak to all of it,” he said. 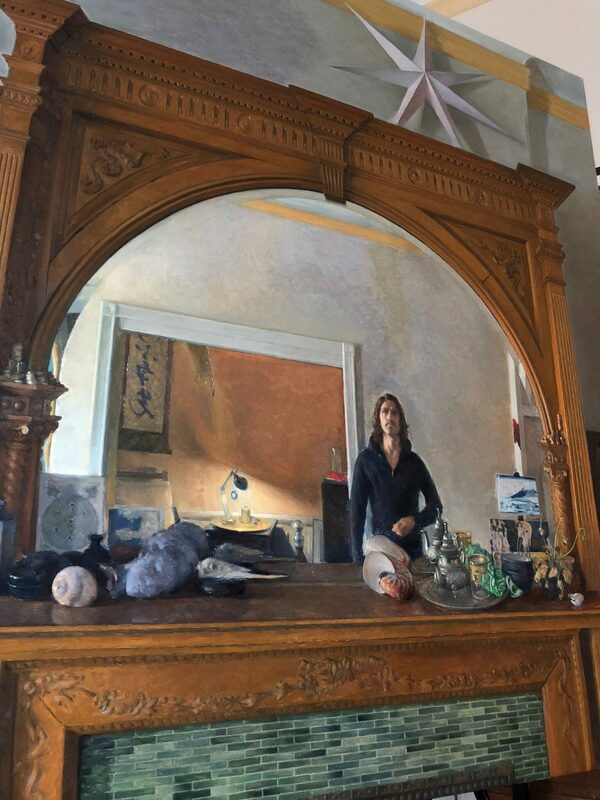 While he’s faced with the infinite possibilities of representing and interpreting the space around him and his own reflection in the mirror, every brushstroke he makes is a conscious choice. The works he creates emanate his intentions. 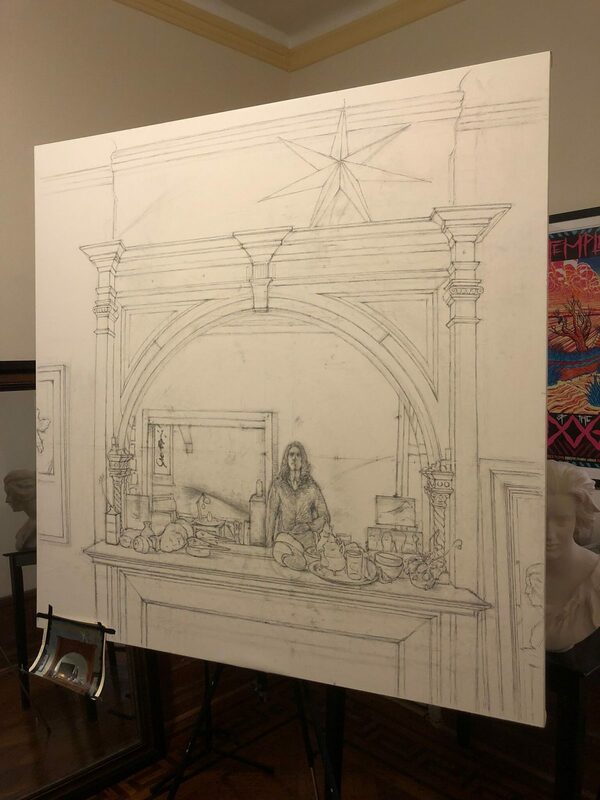 “For me, this process is intended as a deep meditation, an act of love in celebration of being,” Hall said, while he applied a second layer of paint on the large canvas. At the end of May, he put his large painting aside. 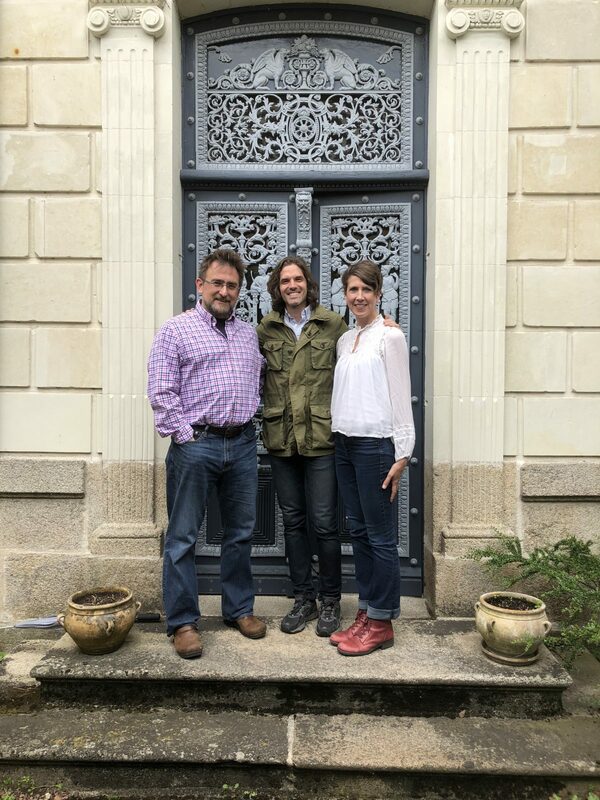 It’s on hold for the summer while he teaches at Studio Escalier in France, in Argenton-Chateau and also in Paris. He has been teaching there every summer since 2011. 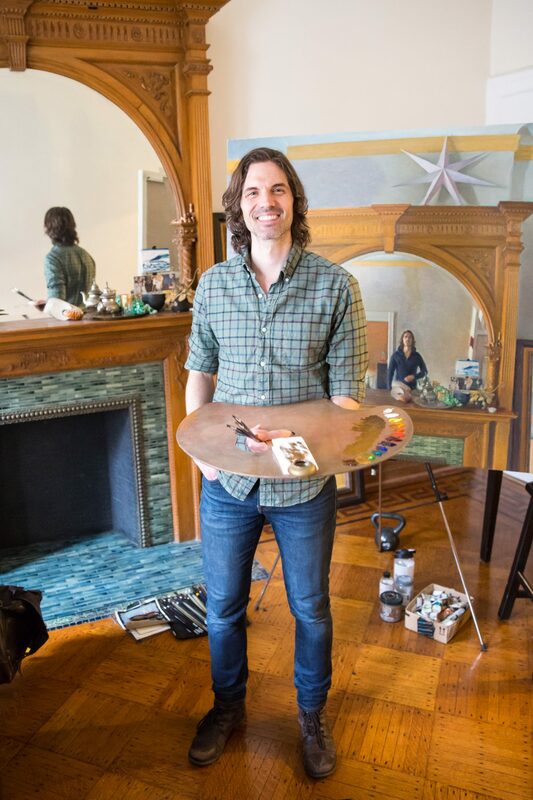 While outside factors and forces—like a one-man exhibition or the market—can pinpoint a milestone by which an artist becomes readily recognizable, the quest of an artist like Hall is endless. It’s not necessarily about wanting recognition. It’s more of a spiritual and philosophical practice. 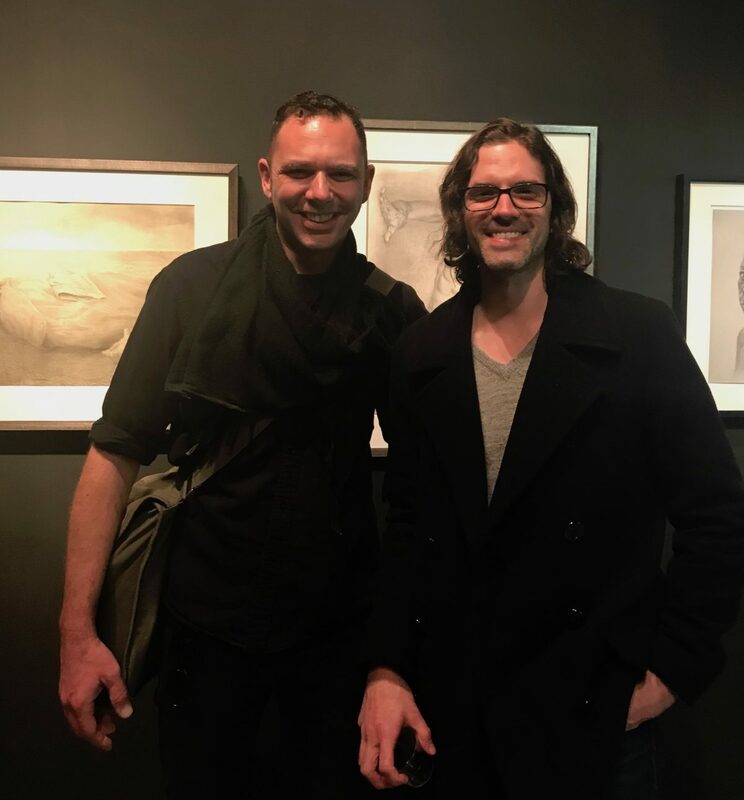 Hall was one of the participating artists in the exhibition “Iggy Pop Life Class by Jeremy Deller” that took place at the Brooklyn Museum from Nov. 4, 2016 to June 18, 2017. 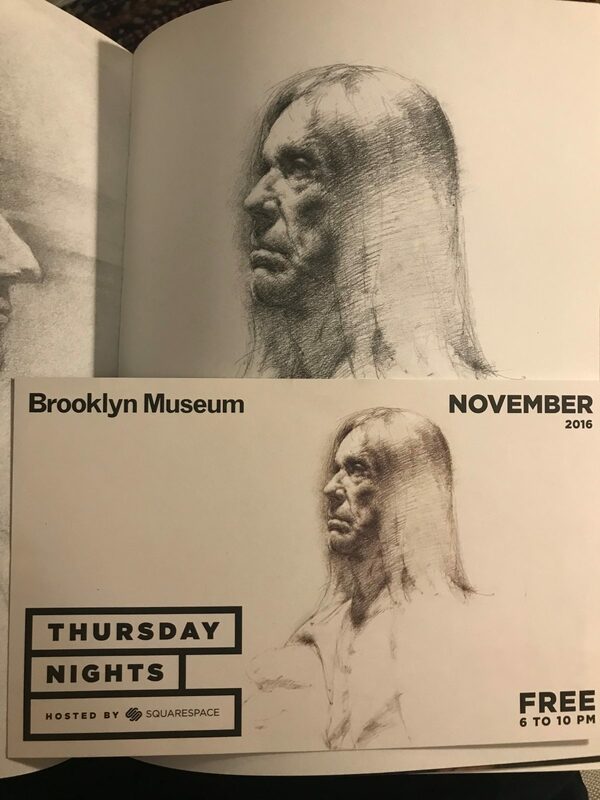 His drawing of Iggy Pop was used for the museum’s exhibition brochures. The luminosity in that museum-worthy drawing is simply arresting. 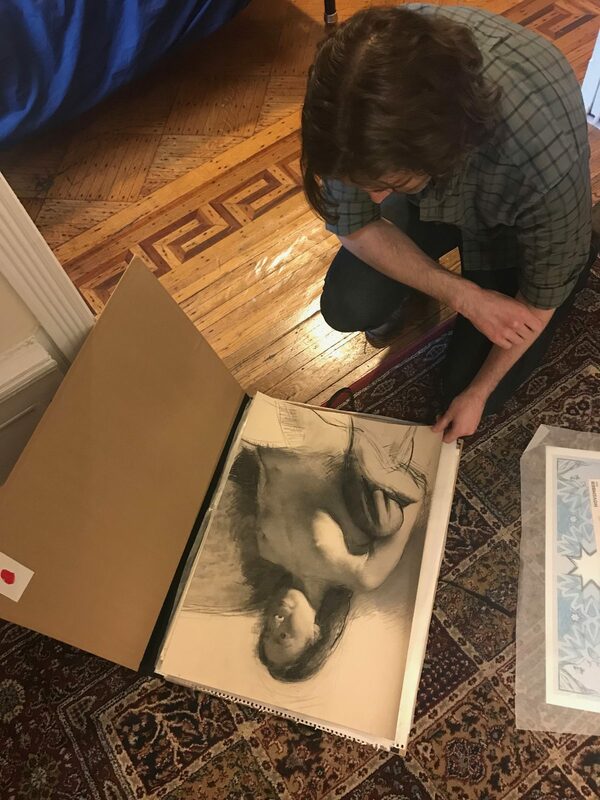 More recently, his figure drawing titled “Push and Pull” was shown in the “On Paper, An Exhibition of Drawings” at The Florence Academy of Art–U.S. gallery in Mana Contemporary, located in Jersey City, New Jersey. The way he has represented his understanding of anatomy, how the light interacts with the forms in the figure, is dazzling. 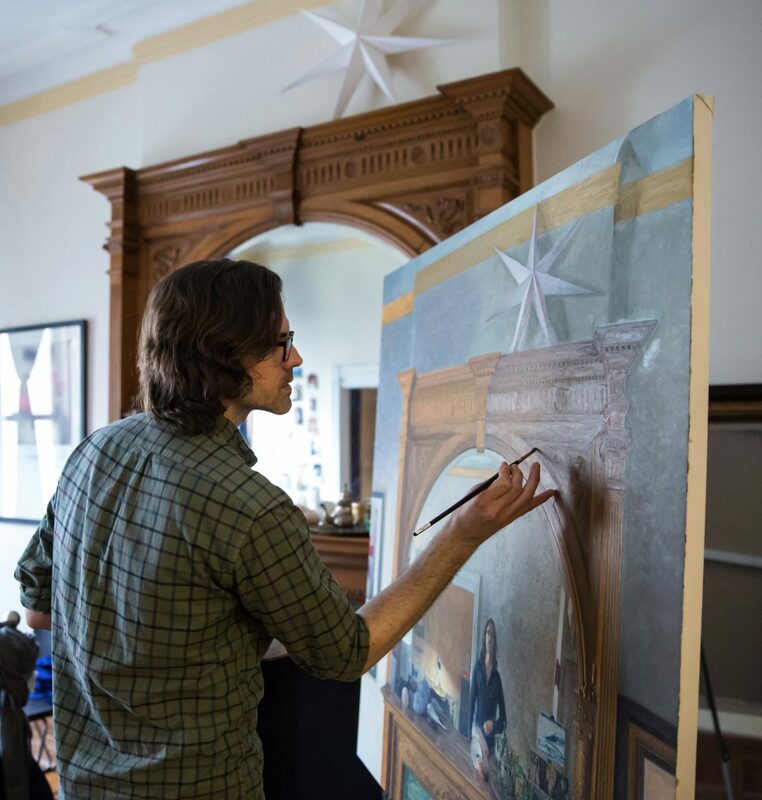 Hall completed his MFA at the New York Academy of Art in the fall of 2017 and since has been building up his body of work. Each study for his upcoming projects and each finished work has a recognizable and unique combination of qualities. These qualities are best seen face-to-face. Though they still look remarkable in photographic reproductions, they look even more so in person. That’s a good indication that what he’s communicating visually in his drawings and paintings is created directly from his own perception. “Presence, empathy, and the potential for connectivity to nature, to others, and to myself is what I find to be the most profound part of the creative process. That’s why it is important for me to paint and draw from life. In my mind, it opens up the opportunity for deep experience and a sense unity in multiple levels,” he said. “All my teachers tend to prioritize working from life. I have absolutely nothing against working from photographic references, but if my goal is to sync my imagination with nature, working from life seems to be the most personally fulfilling pursuit,” Hall explained. In New Mexico, Hall studied with Anthony (Tony) Ryder, a most esteemed draftsman, teacher, and the author of the best-selling treatise on contemporary classical drawing, “The Artist’s Complete Guide to Figure Drawing.” He also studied with the couple Timothy Stotz and Nicole Michelle Tully, who together with Ryder founded Studio Escalier in France. In New York, he studied with Michael Grimaldi, another admired draftsman and a faculty member at The New York Academy of Art. Hall expressed much gratitude toward all of his teachers, starting with Ryder. “I feel as though I came into myself when I began studying with Tony,” he said. “Michael [Grimaldi] brought a physicality to my work. 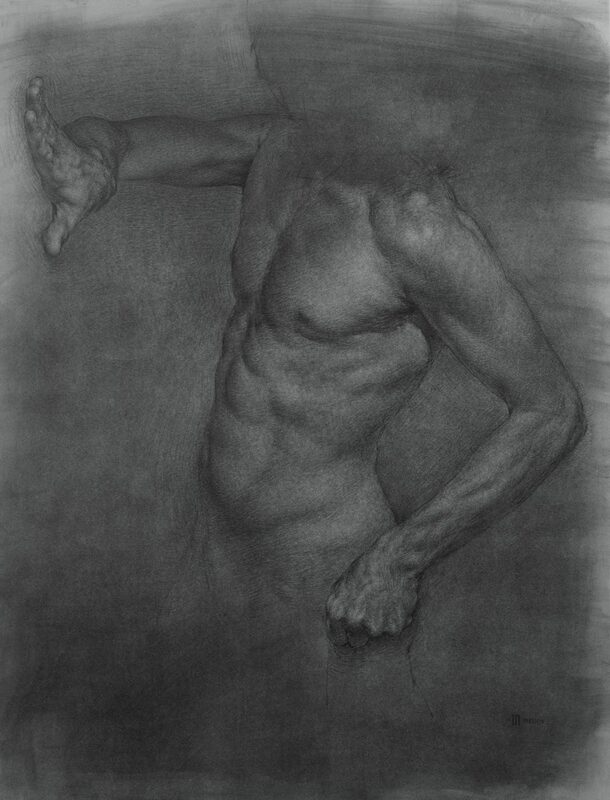 He is about the body: the structural and physical presence of form with an emphasis on anatomy and perspective. That is his strength,” he said. Hall admits he has not fully absorbed everything he has been offered, but he is doing his best to be himself relative to what he has learned. “I feel very fortunate to have been exposed to different perspectives and the various strengths of my teachers,” he said. When he is painting (or drawing), especially when he’s painting another person, he’s in a hyper-aware state—physically, emotionally, and spiritually. It’s an intimate exchange. Both he and the sitter, or model, are vulnerable. It’s a profound connection. “For people who look at art, they want to feel that connection too. So we all want to be unique, but also be connected,” he said. He also reflected on how his strength as a dreamer can also be his weakness, and he strives to find a balance. When he paints, time slips away, and he inadvertently may skip a meal. “I am aware of my tendency to be in denial of certain things. The shadow of that dreamer’s luminosity can lead to the avoidance of certain challenges. I think it’s important to acknowledge it. Sometimes painting can be an escape from anxiety; an antidote to fear. Even though the waves of the creative process present their own set of anxieties, it’s a rhythm that somehow seems more manageable. The process echoes life,” he said. 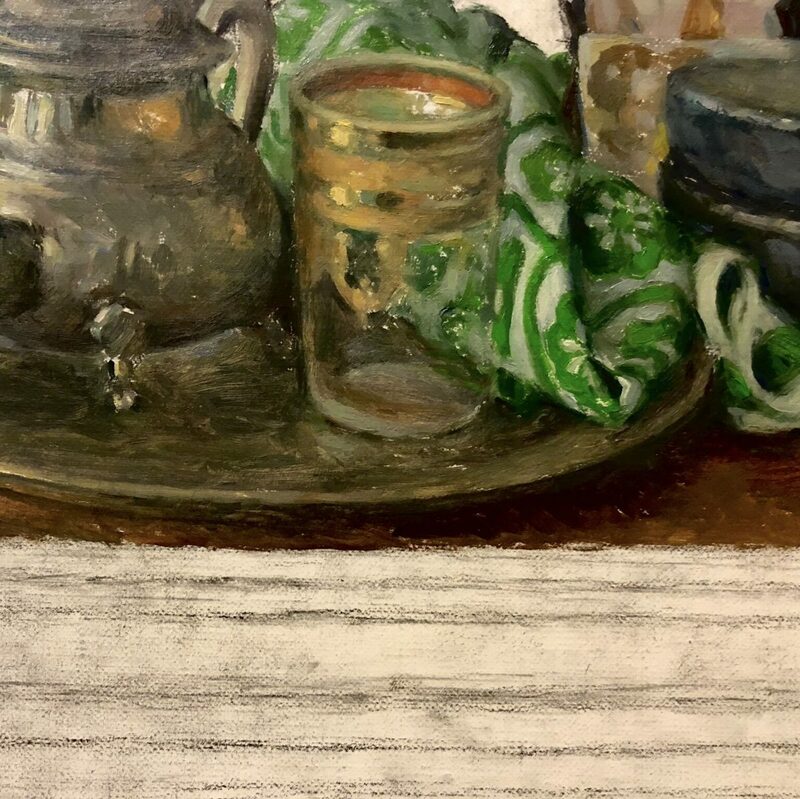 In the broad terrain of contemporary art, Hall, along with many other classically trained draftsmen and painters, is an outlier. Quixotic in his nature and faithfully dedicated to his art, he works relentlessly. 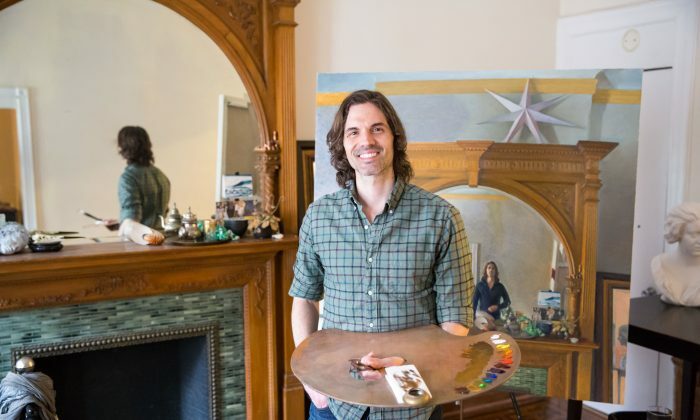 He’s been fortunate to dedicate most of his time to learning and creating art, with the support and generosity of his parents, teachers, and anonymous patrons. “Every step I take is with gratitude for this experience. It’s important for me never to take it for granted, to always honor the opportunity that I have been given,” Hall said. “I feel like I am definitely where I am supposed to be—fulfilled and inspired in my pursuit,” he said.